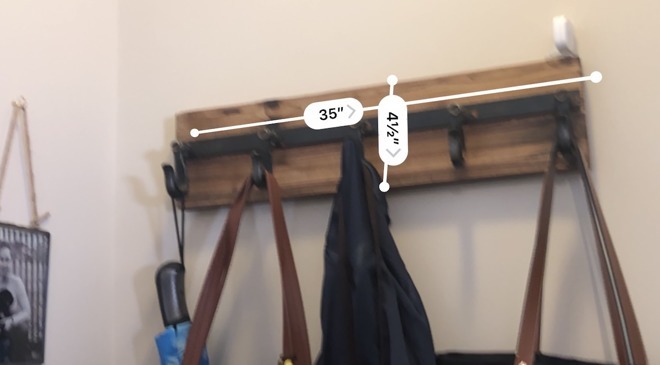 Measure is a simple ARKit application allowing you to measure objects in the real world using the camera on your iOS device. AppleInsider spent some time using Measure in a variety of situations ahead of its release to see how well it really worked. The new Measure adds some functionality, as well as moving some existing features already found in iOS 11. Aside from being able to measure distances, the level feature has moved from the Compass app to Measure. Those two tasks make up the two tabs within the app, as well as the 3D Touch shortcuts. Level appears to be identical to how it worked with previous iterations of iOS, working both vertically and horizontally. It feels right at home within the new app, feeling more akin to measuring than using the compass. 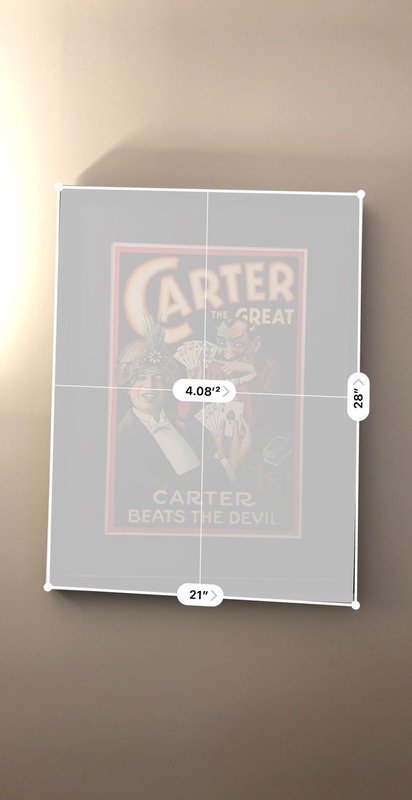 Measuring objects relies on ARKit, Apple's augmented reality framework. Using the camera, it gets the sense of your environment and is able to overlay dimensions in the real world. Once you launch Measure, it asks you to move your device around before adding points. Once ready, a point marker appears in the center of the display. It changes orientation based on whether the surface is horizontal (like a table or the ground) or a vertical (like a wall or piece of artwork). To measure something, tap the + button on the bottom to place a point. It will then anchor to that location in 3D space. A line will start to draw until you place a second point, at which point the distance between the two will be calculated. If an edge is detected, the point will automatically cling to it, making it easy to be more exact. Any time a flat surface is measured, like a picture hanging on the wall, a yellow overlay will identify it. With a simple tap, all dimensions of that picture will be displayed, saving the user the hassle of measuring the whole thing manually. An undo button in the top left-hand corner will undo the last placement, and a clear button in the top right will clear the canvas completely. Apple has even built in a way to save these dimensions in the form of a camera snapshot button in the lower right. 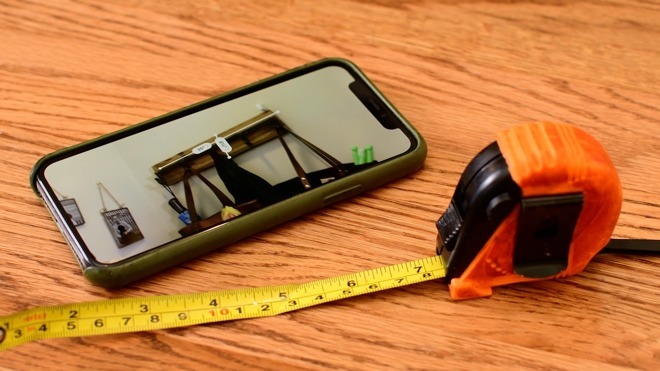 We spent some time measure all sorts of objects and Measure excelled best at measuring flat-surfaced objects, it was undoubtedly a handy feature to baked into iOS. Accuracy was also spot on, with measurements for us usually falling within an eighth of an inch. That margin of error may be too large for some applications, but for most jobs it will do just fine. To date, there is a large number of free/cheap third-party apps on the App Store offering similar functionality to Measure. Those developers may be understandably upset at their newfound obsolescence, but it will be good for users in the long-term. They will either have to add new features to stay relevant, and the basic apps will disappear from the marketplace. iOS was in a similar situation regarding flashlight apps years ago before Apple built in the functionality natively. Measure will be included in the upcoming launch of iOS 12, which is planned for this fall. iOS 12 brings along a number of other new improvements and features including increased performance, Group FaceTime, Memoji, camera effects, grouped notifications, ScreenTime, and much more.